Judy's Doll Shop | Adora Belle - "American Bandstand"
Celebrating the 55th anniversary of American Bandstand, we are pleased to share this Adora Belle doll from Marie Osmond. She is 13-inches tall and is made from the finest quality porecelain. She has long blonde banged hair and big beautiful blue eyes with gorgeous eyelashes. She is dressed in a floral print dress with a wide collar and cuffs, oversized tie and embroidered Adora Belle accent. A striped hat and shiny, white, patent go-go boots complete this groovy ensemble. 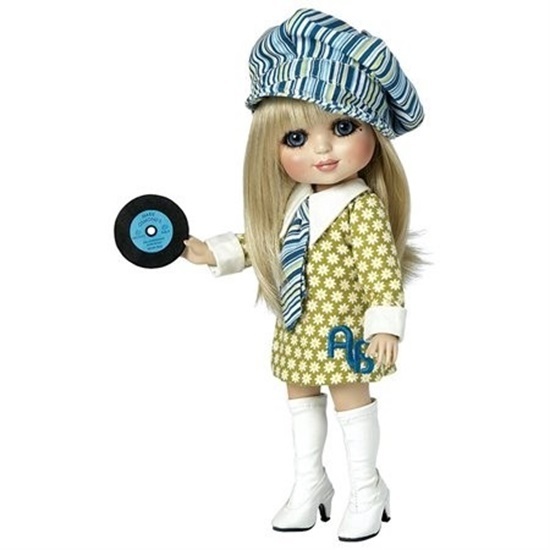 She carried a miniature version of Marie's hit record "Paper Roses". This Adora Belle's doll's costume is reminiscent of the time Marie first appeared on American Bandstand in 1972. She has pierced ears ( a rarity in that day and age) with simple gold studs.